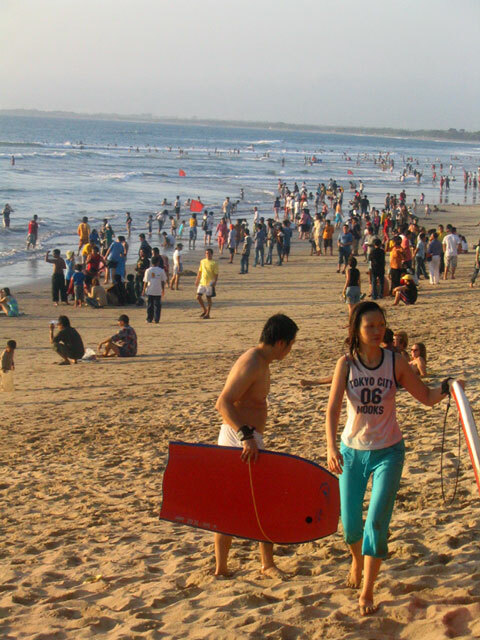 Kuta Beach is a tourist spot located in the south of Denpasar, the capital of Bali, Indonesia. Kuta is located in Badung. This area is a tourist destination abroad, and has become a mainstay tourist island of Bali since the early 70's. 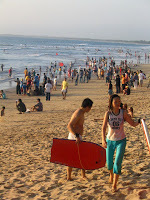 Kuta Beach is often referred to as sunset beach (sunset beach) as opposed to the Sanur beach. In Kuta there are many shops, restaurants and places baths and drying herself. Besides the beauty of its beach, Kuta beach also offers various other types of entertainment such as bars and restaurants along the beach to Legian beach. Rosovivo, Ocean Beach Club, Kamasutra, are some of the most crowded clubs along the beach of Kuta. This beach also has a pretty good waves for surfing sports (surfing), especially for novice surfers. Field I Gusti Ngurah Rai Airport is located not far from Kuta.